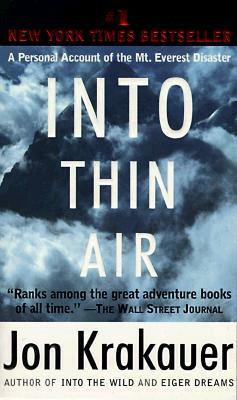 "Into Thin Air" is the definitive account of the deadliest season in the history of Everest by the acclaimed Outside journalist and author of the bestselling Into the Wild. Taking the reader step by step from Katmandu to the mountain's deadly pinnacle, Krakauer has his readers shaking on the edge of their seat. Beyond the terrors of this account, however, he also peers deeply into the myth of the world's tallest mountain. What is is about Everest that has compelled so many poeple--including himself--to throw caution to the wind, ignore the concerns of loved ones, and willingly subject themselves to such risk, hardship, and expense?